Talking, or rather, Skyping with our children last night I found out that the 4th of July was going to be hot. Perfect timing, dear neighbors, for my simple, colorful and cool “macédoine de légumes”. 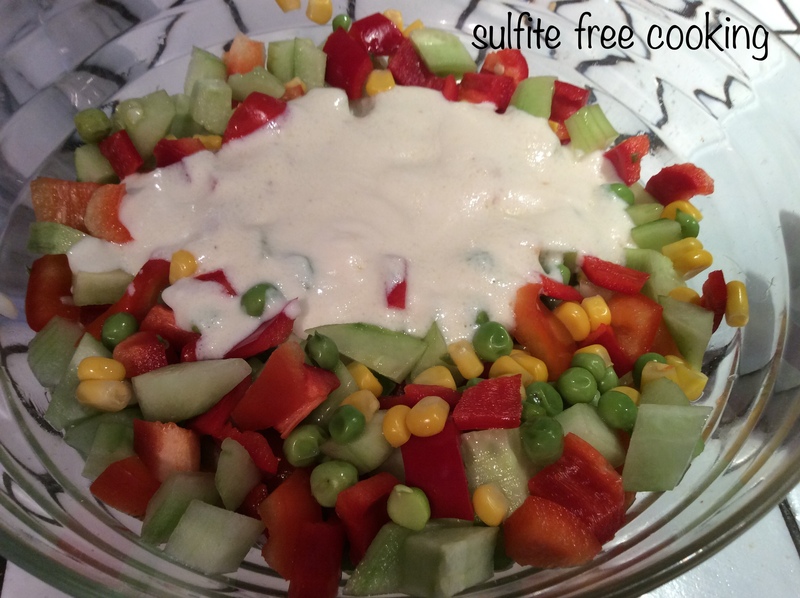 This dish is traditionally composed of small diced vegetables in a mayonnaise. Out of sheer laziness, when it gets hot, I just replace the mayo with soy yogurt mixed with lemon juice and olive oil. Depending on what foods you can tolerate, you can make one using Jack’s recipe (no mustard involved), follow a more traditional one* (with egg yolk, mustard and oil) — provided you can find Dijon-style mustard made with distilled vinegar, or swap the soy yogurt for your favorite kind of yogurt. Same with the vegetables: go for the ones that will not harm your body. I want all my dear neighbors to eat safely… In our case, I used peas, red bell pepper, cucumber and a little corn to ensure at least three different shades of color. Another variation could include green beans, cooked carrots, and rice. *I found this video of a French guy wiz a Reel FRench accent, kinda like Mr Macron, our new president… It just makes me laugh as I never did have a “FRench accent“, having stayed in England time and over again from an early age. If anything, when I met my husband I had a French intonation at times, coupled with… a Liverpudlian accent!!! 1. Combine the ingredients for the sauce, add to the prepared and mixed vegetables, et voilà! Very summery and refreshing – thank you, Joelle! You are welcome, Dolly. I’m sure you are eating lots of salads these days! I generally always eat lots of salads.